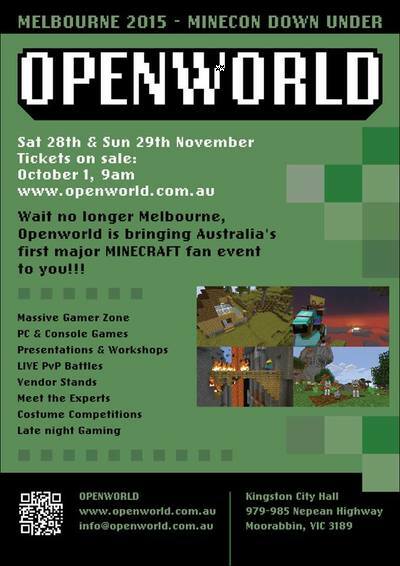 Take note all MINECRAFT fans young and young-at-heart. Australia's very first MINECON event opens at the Moorabbin Town Hall this November, and you can get involved. OPENWORLD's network game zone provides an interactive space where you can join with activities, games and challenges with your fellow fans. Each session in the game zone runs for 2 hours. You can reserve a computer on site, or you can BYOC - bring your own computer. If you prefer to play MINECRAFT on your iPad or similar, you can BYOD - bring your own device and connect with your fellow fans using your tablet or smart phone. Cost: From $50 per ticket. Under 15yr must be accompanied by a full paying parent or guardian.